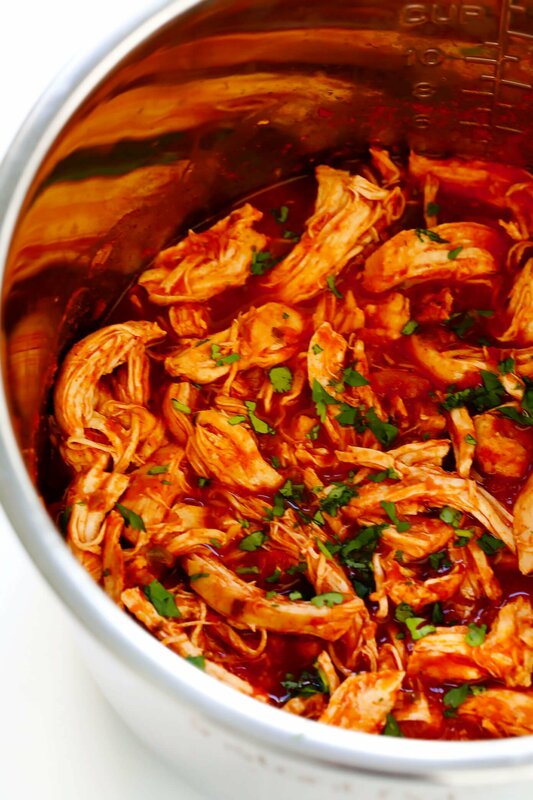 This 3-Ingredient Mexican Shredded Chicken recipe is full of great flavor, easy to make in the Instant Pot or Crock-Pot, and perfect for tacos, burritos, quesadillas, salads and more! 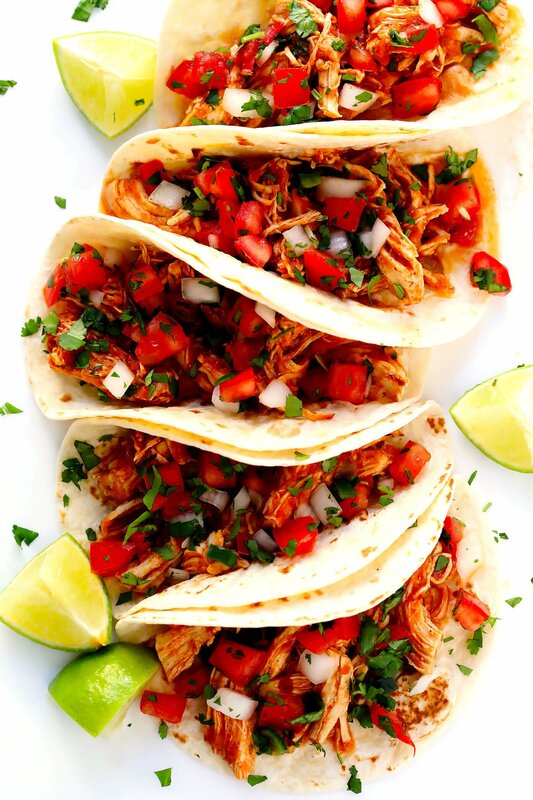 With Cinco de Mayo just around the corner, I feel the need to tell you about the most delicious Mexican shredded chicken hack I recently discovered. Seriously. It’s the perfect back pocket recipe that you can whip out when you’re short on time but craving a winner winner chicken dinner. Because as ultra-simple as this recipe is, it is equally big on flavor, and yields the most tender, juicy, irresistible chicken every time. Perfect for serving with chicken tacos, burritos, quesadillas, tamales, chilaquiles, nachos, or whatever else you may be craving. Chicken: I recommend boneless chicken breasts or thighs, you pick. Salsa: Whatever your favorite kind may be! I have made this with my favorite homemade salsa and my favorite store-bought salsa, and both were total winners. It tastes great. Especially in this recipe. I love the ingredient label. No preservatives, no MSG, no artificial flavors, no dairy…no hesitations. It’s super easy and convenient, and makes this 3 minutes of prep time possible. 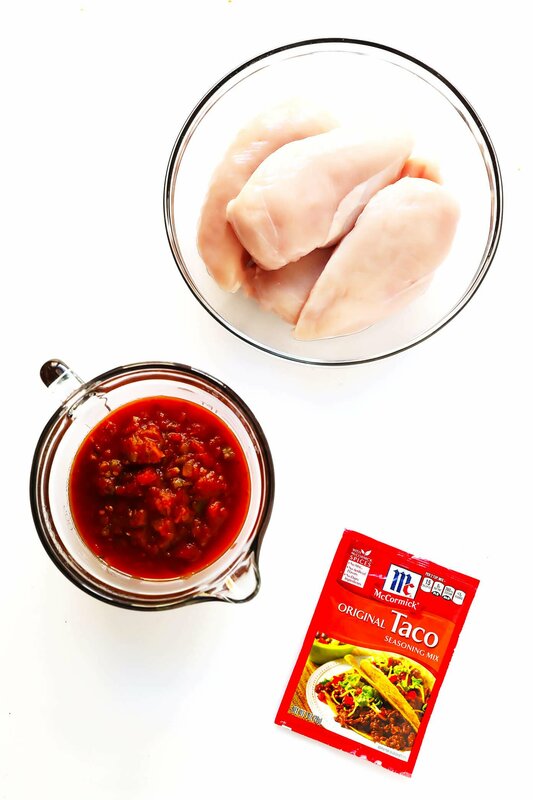 Add your ingredients: Combine the chicken, salsa and taco seasoning together in the bowl of your Instant Pot, and briefly toss to combine. Pressure cook: Then pressure cook on high for about 30 minutes. Quick release the pressure, then remove the lid. 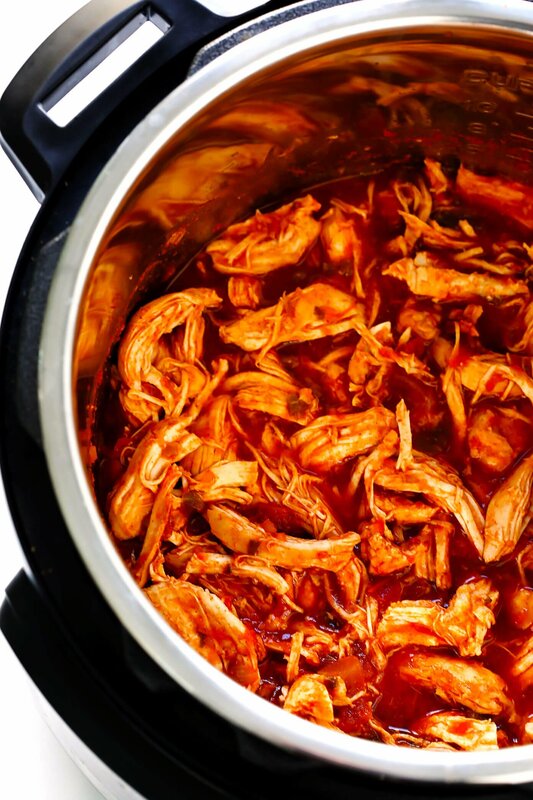 Add your ingredients: Combine the chicken, salsa and taco seasoning together in the bowl of your slow cooker, and briefly toss to combine. 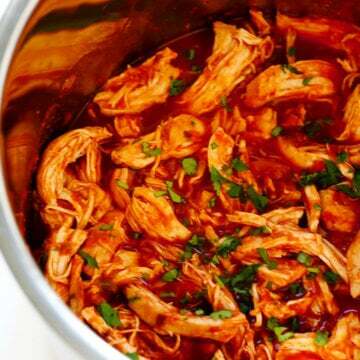 Slow cook: Cover and cook on low for 6-8 hours or on high for 3-4 hours, until the chicken shreds easily with a fork. However you decide to serve this chicken, hope that you enjoy it, everyone! 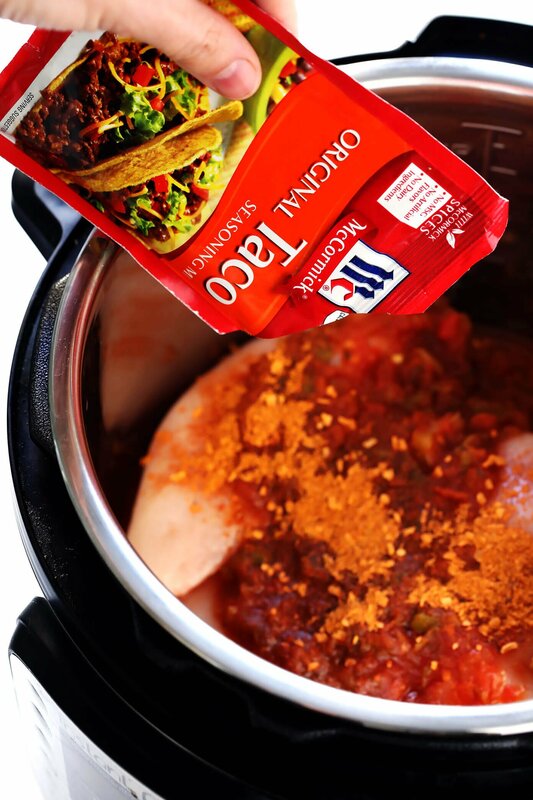 Instant Pot Method: Add chicken, salsa and taco seasoning to the bowl of your Instant Pot, and toss briefly to combine. Close lid securely and set vent to “Sealing”. Press “Manual”, then press “Pressure” until the light on “High Pressure” lights up, then adjust the +/- buttons until time reads 30 minutes. Cook. Then very carefully, turn the vent to “Venting” for quick release, and wait until all of the steam has released and the valve has dropped. Remove the lid. Continue with step 3 below. 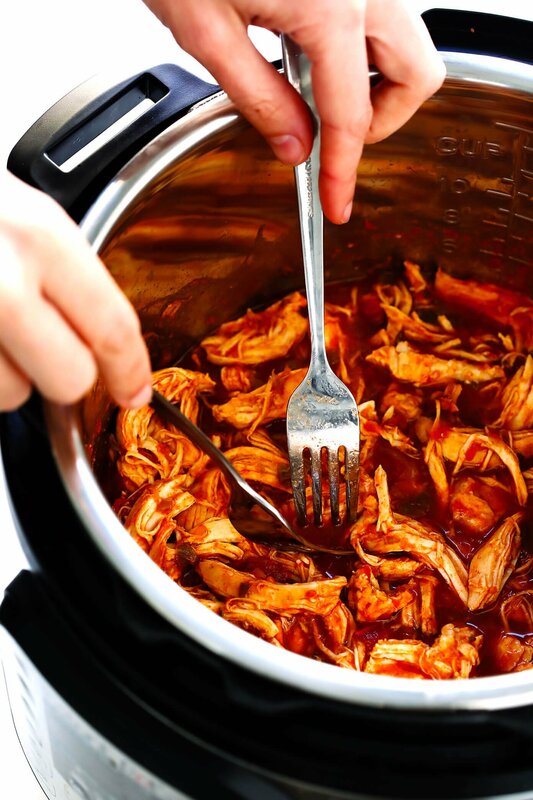 Crock-Pot Method: Add chicken, salsa and taco seasoning to the bowl of your slow cooker, and toss briefly to combine. Cover and cook on high for 3-4 hours or on low for 6-8 hours until the chicken shreds easily with a fork. 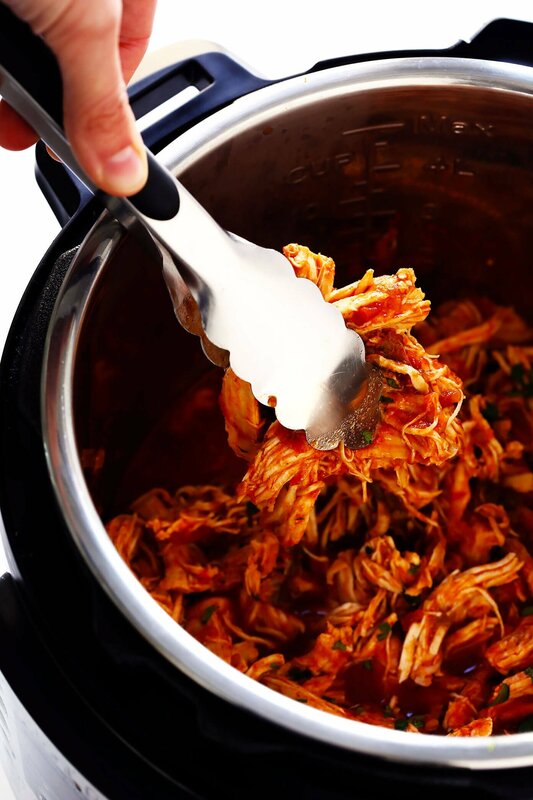 Shred the chicken with two forks, then give the chicken a good toss with the remaining juices. Serve immediately. Or store in an airtight container in the refrigerator for up to 3 days, or in the freezer for up to 3 months. *A few people have mentioned getting a “burn” message on their Instant Pot. I’ve never experienced this, but just to be safe, if you are using a thick/chunky salsa, stir in an extra 1/2 cup water along with the salsa.